Your donations make a huge difference to the work of MFCC and will really help to improve the quality of life for women, men and children suffering domestic abuse. Increasingly we rely on local businesses, private individuals and community groups to give us donations. Anything you can give, or do, will make a real difference! Donations can be made by visiting our donations page and following the instructions on screen. You can make a one off donation or set up a monthly donation to MFCC via MyDonate using all major debit and credit cards or Paypal. 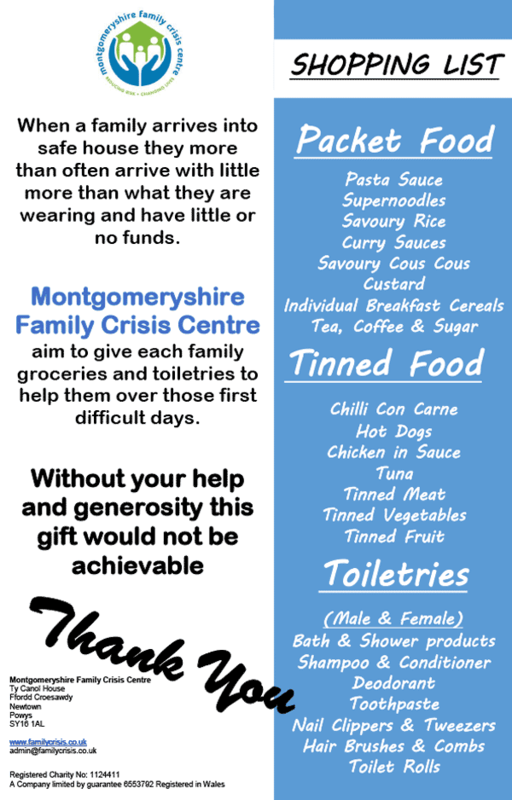 You can send a cheque or postal order made out to ‘Montgomeryshire Family Crisis Centre’ to our head office address. Text MFCC00 £ (amount you wish to donate £1-10) to 70071. For example if you wish to give £5 then text MFCC00 £5 to 70071. You’ll receive an acknowledgement via text. The amount you choose to donate will then be added onto your mobile phone bill or taken from your credits if you use pay as you go. If you would like to donate items directly to our safe houses, please contact us and we can let you know the items which will make the most difference. You may wish to organise a community fundraising event on our behalf. Your event can be anything you want it to be; a cake sale or coffee morning, perhaps a car boot, a bingo or quiz night. We can provide you with publicity materials and collection boxes. Why not set up a Fundraiser page through MyDonate if you would like to raise money through sponsorship, it just takes a few clicks. If you are a local business you may like to have a collection tin or food and toiletry collection bin displayed at your premises. Why not donate your carrier bag charges to MFCC. If you would like any further information regarding making a donation or supporting us in another way please do not hesitate to give us a call or send an email, we will be more than happy to discuss this with you. 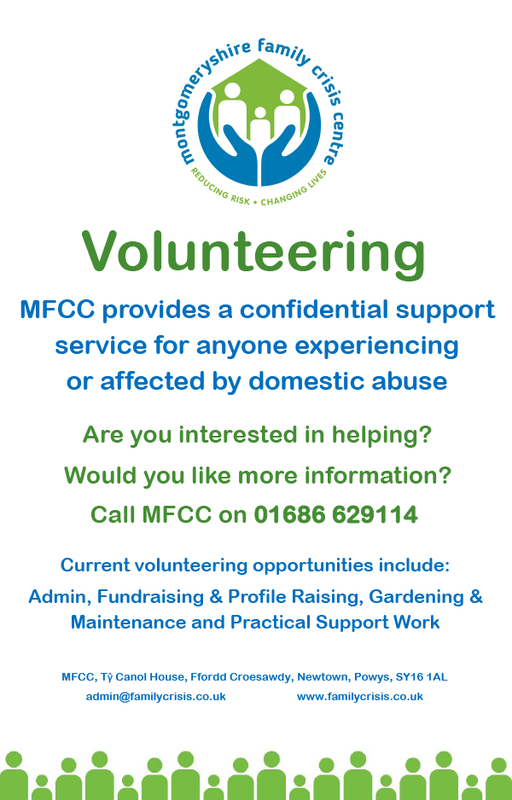 MFCC really value the work of volunteers, which greatly enhances our capacity to deliver a comprehensive service that fully meet the needs of those experiencing or affected by domestic abuse in North Powys. Volunteers often bring with them a wealth of experience along with fresh perspectives and ideas that truly benefit our work. As a volunteer, you will certainly be making a positive difference to our organisation, but we also hope that volunteering will benefit you as well. You can get a lot of satisfaction from volunteering as well as gaining new skills, meeting new people and increasing your confidence and self-esteem. Our volunteers will be trained and managed, just as other members of the team, and we have a volunteering policy to ensure that the working relationship is clear and rewarding for all parties. We may request references and DBS checks prior to starting in some roles. Anyone can volunteer. It doesn’t matter what experience you have, what skills you have, what background you’re from or how much time you can commit, everyone has something to give. Volunteering can be done on a regular, occasional or one-off basis, by individuals or groups. 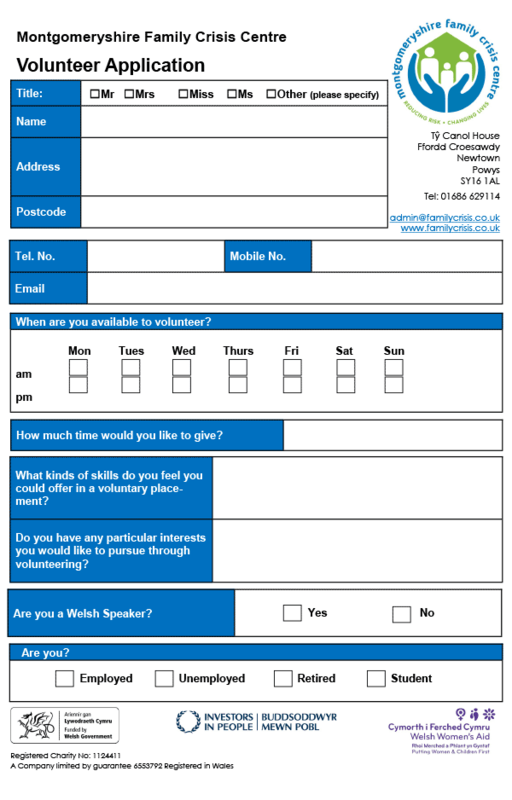 We regularly recruit volunteers to work across all services, and enquiries can be made at any time. Admin, Fundraising & Profile Raising, Gardening & Maintenance and Practical Support Work. Why become a Trustee for MFCC? Being a trustee can be a very rewarding voluntary position. You will help MFCC to support women, men and children experiencing domestic abuse in your local area. You may also be developing your own skills by gaining knowledge and experience of business management, finance administration and learning about the voluntary sector. Acting as a Trustee is an opportunity to develop your personal skills and confidence. As a Trustee you have ultimate responsibility for directing the affairs of MFCC, setting policies, formulating strategy, ensuring it is solvent, well-run, and delivering the outcomes which have been set. Your duty is to govern MFCC and Trustees are responsible for overseeing the management and administration of the group, enabling MFCC to be managed effectively. You will be focused on the strategic direction of MFCC, and will not be involved in the day-to-day running of the organisation. Further information in regards to the role of Trustee is contained in the Charity Commission publication ‘The Essential Trustee; What you need to know’ CC3. There are bi-monthly Board meetings, sub-group meetings and an annual general meeting every year. Occasionally you may be asked to take part in other meetings such as Away Days, recruitment, or to represent MFCC at conferences and external meetings. You will need to set aside time prior to each Board meeting to read through the papers and prepare for discussions, and to respond to e-mails etc. sent to you between meetings. For further information contact us. We can send you an information pack and application form and arrange for an informal chat with other Trustees about the Charity and what being a Trustee entails. There is a probationary period for new Trustees to settle in. MFCC would like to extend their THANKS to all who have donated or given up their precious time over the past year.